Microsoft has rather sneakily rolled out a new way to help people connect the cloud services they use, including Slack, GitHub, Facebook, Twitter, Dropbox and more. The service would seemingly compete directly with the likes of IFTTT and Zapier. What exactly does Flow do? Services like Flow and IFTTT (IF This Then That) allow you to create simple conditional workflows that automatically take actions in response to certain events. 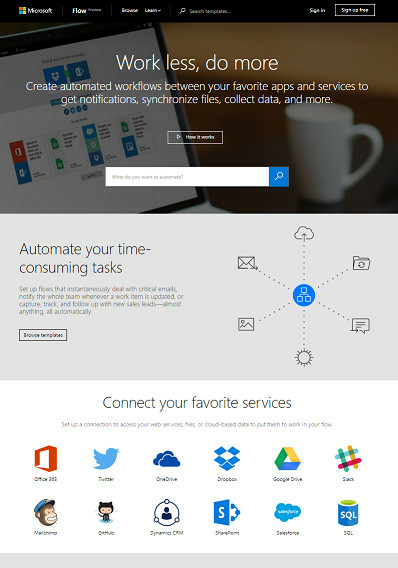 Notice how much you can do with services that aren’t owned by Microsoft? That’s in line with the company’s recent support of other operating systems and its partnerships with competitors like Red Hat and Canonical. Once Flow is officially announced, it will be free and open to everyone. Developers will be able to create custom workflows and make them available to other users through APIs. This is another great example of Microsoft opening its doors to the outside world.